A gun is just like any other object such as a knife. What matters is the person using the object, not the object itself. There is no such thing as a bad gun or good gun, good and bad are qualities of the person wielding the gun. This is tied to the idea that guns don’t kill people, people kill people. A subset of this argument is that the only difference between assault weapons and other types of guns are purely cosmetic. They only look like military grade weapons. If a gun was the equivalent of a knife or hammer, we would expect there to be an equal tradeoff in deaths by each of these weapons whenever regulations are imposed which restrict access to one of these weapons. If the number of gun deaths fall due to more stringent controls on guns, there will be at least an equal and opposite rise in deaths by weapons such as knives and hammers, gun advocates assert. This is definitively not the case. Guns have a higher lethality factor than these other weapons, which is empirically borne out. Where there are more guns, there are more homicides. When effective gun laws are introduced, gun homicides decrease, and there is no corresponding increase in homicides by other methods. When assault weapons are used to carry out mass murders, far more people are injured or killed on average than in other mass shootings. This argument also assumes that guns and knives (or any other non-shooting weapon) have equivalent amounts of social utility and are used much in the same manner. Just as we discussed in the Drunk Driving Fallacy post, this is false. 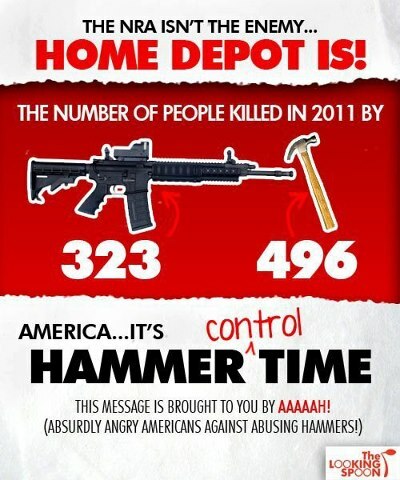 Knives, hammers, and spoons all have a purpose other than inflicting deadly harm upon another. Guns don’t. Guns are designed with the sole intention of seriously harming and potentially killing something or someone. The ability of assault weapons to inflict large amounts of carnage is crucial regardless of the owner’s intent, as these weapons can easily fall into the wrong hands. Hundreds of thousands of guns are stolen from private citizens every year. These guns go directly into the hands of criminals, and each stolen assault rifle decreases the security of our streets by far more than each stolen pistol. Just as the Newton shooting so tragically showed, an assault weapon in the home can be turned against the owner by a family member and then used to murder others. A form of this “gun is just a tool” theory is often interjected into to the assault weapons ban debate. Gun advocates contend that the difference between scary looking, military style assault rifles and other rifles or even pistols is merely cosmetic. Assault rifles shoot bullets just like any other gun: pull the trigger. Everything else is basically irrelevant and centers on looking cool rather than performance. To a small degree, this argument is accurate. Gun companies go overboard trying to make their products as macho as possible (An exception to this rule is guns designed for women. Apparently pink handguns are the newest fashion craze among women in the NRA). If you compare two assault rifles of the same caliber, and same general quality, you will get the same results regardless of how macho the gun looks. Pull trigger, gun fires. That simple. However, this argument completely falls apart when comparing assault rifles to pistols and other types of rifles. Let’s first examine the differences between assault rifles and pistols. Although the mechanism for firing is the same for both weapons, the similarities end there. Assault rifles, in terms of killing potential, are simply the superior weapon. A bullet from an assault rifle travels much faster than one from a pistol, meaning it will inflict far more damage on impact. The same differences hold for hunting rifles. The bullets from assault rifles also travel faster than they do from small game hunting rifles. The muzzle velocity from small game hunting rifles ranges from 700-2,000 feet per second (for Remingtons); with an assault rifle this soars to 3,000. This is a devastating difference. As a medical study of military casualties in Iraq found, bullets traveling faster than around 2,500 feet per second create damaging shock waves that inflict much more internal destruction than bullets traveling at lower speeds. Notice that the average bullet speed from an assault rifle is 500 feet per second higher than the velocity required to create shock waves, making these weapons especially lethal. Imagine, for a moment, your stereotypical mass-murderer-to-be planning his deadly assault. On his living room table, he has laid out the following instruments of death: a spoon, a machete, a hammer, a pistol, a standard hunting rifle, and an assault rifle. Which will he choose to carry out the deed? If we accept the argument that an assault rifle is no different from the rest of these objects, the choice of weapon will be shrouded in mystery. After all, following the quotes at the beginning of this post, if you attack a crowd of people with any of these objects, it could be classified as an assault weapon. Of course, we all realize that your stereotypical mass murderer (who is a death optimizing machine according to these same gun proponents) will instantly choose the assault rifle. If he wants to maximize causalities, he will choose the weapon that makes it the easiest. Now notice that the same logic falls apart if this person is not a mass-murderer-to-be but instead trying to choose the best weapon for his safety. The additional killing capacity of an assault rifle is of little help (barring authoritarian takeover or zombies), and actually increases the likelihood of hurting an innocent. A brief note on the origin of “assault weapon”: Some gun advocates have recently contended that the term “assault weapon” is made up by the liberal media and their ilk to refer to any gun they want to ban. This is false. The term “assault weapon” has a long and illustrious history in the gun community, which is well documented here.